Striving to improve the governance of a global ocean observing system, including advocacy, funding, and alignment with best practices. Climate Variability and Predictability (US CLIVAR) is a national research program with a mission to foster understanding and prediction of climate variability and change. Coupling, Energetics and Dynamics of Atmospheric Regions (CEDAR) as a focused Global Change program. 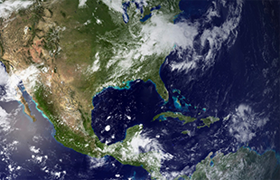 SOCCR2 is an authoritative decadal assessment of carbon cycle science across North America, developed by over 200 experts from the U.S., Canadian and Mexican governments, national laboratories, universities, private sector, and research institutions. SOCCR2 is a Sustained Assessment Product of the U.S. 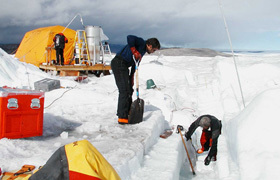 Global Change Research Program. See the SOCCR2 document. Check out From Science to Solutions: The State of the Carbon Cycle from the OneNOAA Science Seminar Series. "Your staff did an exemplary job in all aspects of coordination. This meeting was one of the rare instances that I did not hear a single complaint regarding organization." "The mentoring I received has been very stimulating and intellectually challenging. I was very impressed with the responsiveness of the CPAESS office during my fellowship." "I have found this very valuable for building a diverse new skill set and professional relationships. CPAESS was an excellent administrator of this fellowship." "CPAESS staff was more than pleasant when dealing with the 220+ scientists we had at the meeting. They were prepared and there were no glitches." "I only wish every administration was as responsive, proactive, and pleasant as the people I've interacted with at CPAESS." "The fellowship program is valuable because it provides hosts an opportunity to work with excellent young scientists without a lot of administrative burden." "Everything CPAESS staff arranged worked out just the way it was supposed to." "I am grateful to CPAESS and the Naval Research Lab for the valuable opportunity that this appointment provided for my career growth." "The NOAA C&GC fellowship has been crucial in allowing me to pursue a career in atmospheric chemistry..."
"The UCAR CPAESS administration was very helpful in facilitating my appointment. They should keep doing what they are doing." "I think this is the most successful postdoc fellowship program out there." "The Summer Institute provided great presentations and an outstanding cohort of active and former fellows." "I would like to thank CPAESS and the University Corporation for Atmospheric Research for outstanding supporting of the 10th meeting of the International Committee on GNSS (ICG)." "I have only good words to say about CPAESS. Everyone is prompt and courteous in helping. I really appreciate the policy from UCAR that allows postdocs to be co-PIs on grant proposals." "The professional staff at CPAESS has made it their business to understand every aspect of program management relevant to investments in scientific research." "CPAESS played a truly pivotal role in making this meeting of the panel highly successful as well as comfortable and relaxed." "They know exactly what they are doing and are therefore quite relaxed but at the same time in full control." "Postdoctoral fellows of the caliber supported by this program are of colossal value to the intellectual energy of any lab ..."
"Even the unexpected was adequately planned for! ..."
"I can't tell you all how great it is to work with you! I wish every meeting I planned had such fantastic (and fun) support." "The C&GC program allows the flexibility to collaborate with other researchers, which leads to opportunities after the fellowship." "The structure of this program is wonderful. The Summer institute has a lasting impact on the fellows, through the connections that they make..."
"The CPAESS staff have been exceptionally accomodating throughout the process of the application and award...Each of my interactions was pleasant and enjoyable." "I had an absolutely amazing time as a NOAA fellow – a really life-changing experience that has set me up for a career in science." "Thanks for the great job organizing and handling us. Everything worked great, and I was really pleased that all went so well." "The WCRP community is indeed fortunate to have the skills of such a talented group of individuals available for such critical events." "It was so nice having you there to manage the logistics so we could focus on other things." "I really appreciate the great support you all provide. It sure makes hosting meetings a breeze." "CPAESS was always a step (or several) ahead of me. The logistics were flawless in all aspects..."
"The C&GC fellowship experience has been very productive and rewarding. I have learned a lot in terms of research, teaching, & applying for faculty positions." "... JOSS (now CPAESS) brought a level of expertise and experience in planning these kinds of scientific investigators meetings that was superb." We provide professional development, training and research opportunities for early career to expert scientists. We provide the framework for end-to-end event planning and management. Check out our Postdoc's Research presentation on Odd Oxygen in Tropospheric ozone. In partnership with NOAA's OneNOAA Science Seminars the U.S. Carbon Cycle Science Program has kicked off a series of seminars called Science to Solutions: State of the Carbon Cycle. Check out past and future content. Workshop on Building an Interannual to Decadal (2 to 30 year) Prediction/Projection Capability for Decision Support has been rescheduled to June 5-6, 2019. 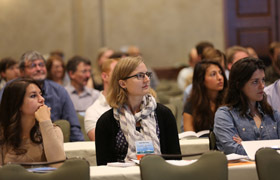 We assemble experts and early career scientists, engineers, IT and program managers to work on large-scale efforts that address compelling national science problems. We are a team of professionals that provides experience, value and expert management tailored to meet specific needs of the Earth science community. Our Vision: To advance innovative scientific research and collaboration efforts for the benefit of society. Our Mission: To develop customizable solutions to complex scientific challenges by advancing research capability, building community collaborations, and fostering scientific leadership and workforce. We are diverse, we are versatile, and we are reliable.